While the CPAP was once the primary treatment for sleep apnea, the American Academy of Dental Sleep Medicine considers oral appliances to be the first and foremost method of treatment for mild to moderate cases of sleep apnea, and for those who cannot tolerate CPAP therapy. 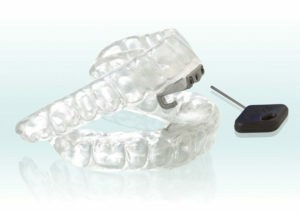 Oral appliance therapy (OAT) is increasingly gaining popularity as a first-line treatment option for many diagnosed with mild to moderate sleep apnea. OAT has a much higher rate of acceptance by patients and is considered one of the best alternatives to treating sleep apnea for those who are non-CPAP compliant. Many patients say it’s as easy as putting in a mouthpiece before going to sleep, and claim to feeling refreshed upon waking after the first night of use. Oral appliances are best custom fitted and administered by a specially trained dental sleep medicine professional, who will take impressions to fit a custom oral appliance to each patient, and then adjust, or calibrate, the appliance over time to achieve maximum relief. The Narval CC™ is a custom-made mandibular repositioning device (MRD). It has patented physiological articulation and unique comfortable splints to optimize patient acceptance and treatment efficacy. The Thornton Adjustable Positioner® (TAP®) is an oral appliance similar to an athletic mouth guard that is worn while sleeping. Developed with advanced technology, the TAP® reduces sleep apnea and associated health risks without the need for surgery, medications, or other more cumbersome therapy.